Agate Bay is a neighborhood of almost +/- 650 residential properties located within the larger community of Carnelian Bay. Agate Bay is located on the North Shore of Lake Tahoe, California and begins just past the east-end of the downtown commercial core area of Carnelian Bay and the beginning of Tahoe Vista. The Agate Bay neighborhood was believed to have been named because of the large volcanic rock formation containing agate rock that can be seen for several miles when you are out on the water. This large mountain-side rock outcrop is located up behind Granite Road on the east-end of the subdivision. Agate Bay also has a small bay (cove) within the larger bay of Carnelian Bay in Lake Tahoe. This popular residential neighborhood always seems to be in demand with buyers. The subdivision offers a variety of house styles, options, and price points. You will find a mix smaller, older Tahoe mountain style cabins along with larger, newer mountain homes with high-end luxury features. Sewer – All properties in the Agate Bay area must be tied into the North Tahoe Public Utility District (NTPUD) public sewer system. One of the optional neighborhood features that many of the Agate Bay properties have for their owners is a club membership in the Agate Pier and Swim Club, sometimes referred to as the “Sun Club”. Property owners will have either a Tier I or Tier II optional recreational club membership programs. Some real estate agents may refer to this optional “Club membership” as a “home owners’ association (HOA)” because membership into this club is restricted by geography. You can only be a member if you own physical real estate within the Agate Bay subdivision. It is important to know it is not a mandatory club/HOA, and it is therefore not subject to the Davis-Stirling Act California Civil Code that covers HOA groups and their mandatory disclosures to new owners – this is a club nor a mandatory Planned Unit Development HOA membership. Transfer Fee: Transfer fee between owners is $1,000 (For the year: 2019). Buying/Gaining Membership: If a home does not have the optional club membership and would like one they either need to buy/negotiate a purchase price from an existing current member, or buy one directly from the club if they are available. Approximately Tier I Members: 50 current members. If an owner wants to provide access to the Agate Pier and Swim Club to someone using their home, the club will charge an additional fee. See APSC rules for more information. Tier I Membership: Includes access to a seasonal swimming pool, in-ground hot tub/spa, and tennis courts. Tier II Membership (also referred to as Level II): Includes a Tier I membership so Tier II members get access to the seasonal pool, tennis courts, along with access to the gated Lake Tahoe pier area, sun deck (some beach area), and a buoy access program (see club rules for more information). The Agate Pier and Swim Club has three home owner amenity recreational areas. 453 Agate Road | Pool, in-ground hot tub/spa and sand volleyball court, BBQ and lawn area. The primary benefit of the Agate Pier and Swim Club is to provide a community neighborhood recreational experience for its members by providing access to either Lake Tahoe (shared pier use, beach, sun deck and a buoy access option) along with other outdoor recreational amenities such as the pool and tennis court amenities. Why buy a home in Agate Bay, California? There are so many reasons why primary and secondary home owners enjoy this community. 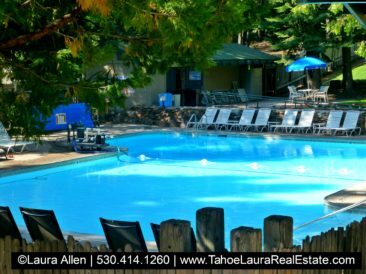 Homes for sale are very desirable because of their close proximity to Lake Tahoe recreational activities. Easy access to great public beaches in downtown commercial core of Carnelian Bay. These beaches are also dog friendly, so those home owners with a four-legged fury friend like knowing they have easy access to Lake Tahoe beaches. The area also offers boating, hiking, biking, tennis, golf, skiing, shopping, and restaurants. The Agate Bay area is known for having larger lot sizes, wider streets, a number of properties with relatively level, or gradual sloping driveways, and easy year-around access. Agate Bay is in a good central location on the North Shore making it easy to get to Tahoe City, or Kings Beach. For those that enjoy winter sports you will find this central location very convenient to get to any of our near-by local ski resorts including: Northstar, Alpine Meadows, or Squaw Valley. The Agate Bay area carries a market premium on the North Shore. You will find modest, older cabins that need work, to luxury multi-million dollar lakefront estates. Agate Bay lakefronts, homes, and cabins have ranged in price from the mid $400,000’s to $10 million for a lakefront home. The selection of Agate Bay homes will vary, and can be extremely limited depending on the current estate market conditions. 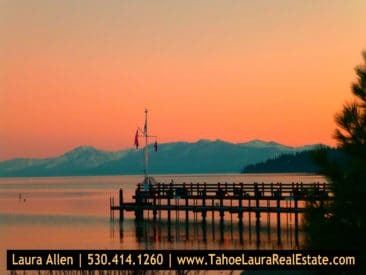 The Agate Bay area is a favorite for Tahoe second home owners and is a great place to live all year long! 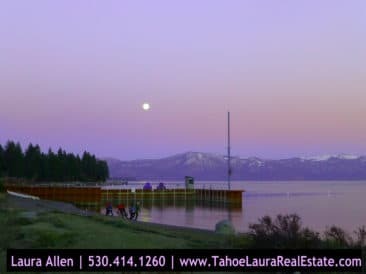 If you already own a home in the Agate Bay subdivision and want to know what your property is worth, call me 530.414.1260 for a confidential consultation. Do you want help figuring out the neighborhood HOA fees and which area will best meet your needs? Call me at 530.414.1260 and I can help you find the right place to buy!